Hi Ray. Your diary inserts are really great, thanks for sharing them with us all! I was wondering if you had any plans to do a personal, lined, week on two pages with equal space for all seven days and a 'Things to do this week' box before Monday? I'm planning to move up to the personal size and this would be a great option for me. No worries if not, I'm sure I'll find an alternative to suffice! Lucy, have you seen Filofax's cotton cream week to view? It's pretty much what you're describing. Yes I have, thanks. I currently use that in my Pocket but have decided to move up to Personal. This will be my diary of choice; I just wish it was lined! Never mind. I might have a go at using one of your other ones, time management was it? 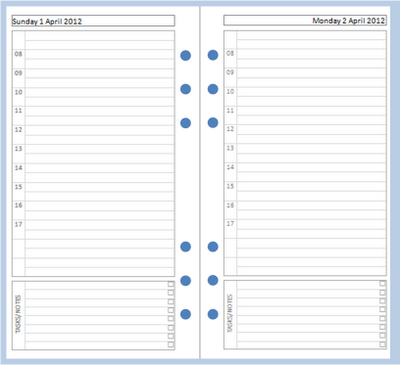 I can put a jot pad page in every week for things to do that week I suppose. Time to play about with my new Filofax that arrived today! What fun! And no - I don't get out much. Let me know if you run into trouble and I'll try and help. I thought I saw that same day-per-page in personal but can't find it. I can't find it on Philofaxy nor here. Maybe I just missed it. Would you show me were is the link? My other question is, I don't understand how to use the source files. If I want a day-per-page without notes just the times breaking down in 1/2 hours from 7a till 11p, should I manually just merge the rows or learning how to use those source files would actually make my life easier? Assuming you don't want to edit the table 365 times, you should definitely just edit the base file and run a merge. Have you ever used Word's mailmerge facility before? And no, I have never used that mailmerge thingy. I read your tutorial somewhere but seem complicated for me. I need to try again. Do I edit the "base file" on excel? The main amendment would be to the base Word file. How about if I make you a set for April? Email me (ray DOT blake AT gmail DOT com). That is exactly what I need my pages to be like - no notes but the times running across the whole page and from 7 am to as late as will fit on the page. 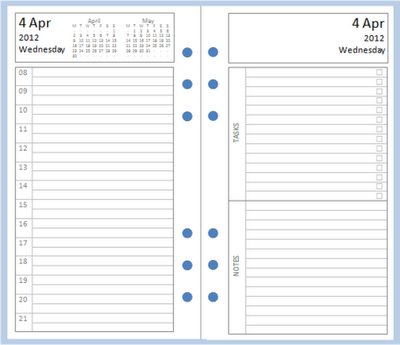 Also would like that in A5 as I am thinking of printing on A5 to put in my personal but punched along the short top side and folding so I have more room and putting the week pages between weekly sheets so I can have an overview with daily pages in the middle. Ok I have been playing with the layout to make a week per view with a notes section before Monday then have Tuesday and Wednesday on page 1. 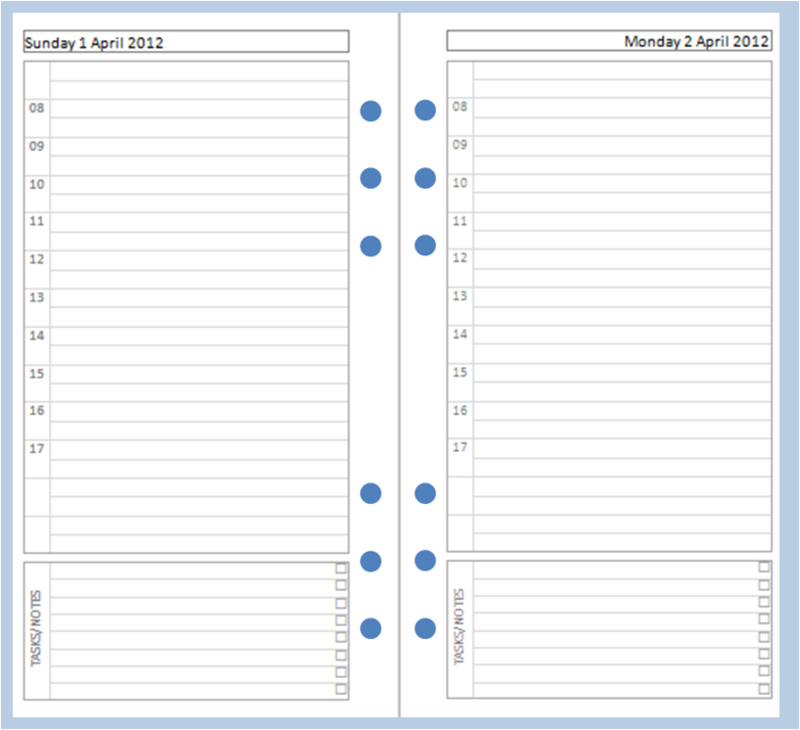 On page 2 I have Thursday, Friday and have split the remaining space on between Saturday and Sunday. All was going well until I tried to fix the dates in the boxes and got VERY confused looking at the Excel sheet to work out what tags I should put where! What is all the different WBDate, WADate and Date bit is all about? The A5 week on 2 pages TM view was so much easier to work out! How do I work out which tag goes where??? It might help if I tell you that WB is short for Week Before and WA for Week After. If you study where the fields are in the original version, that should clarify the necessary page order for you. I fixed it! had to remove all the links properly and re-link! Also needed to put in some extra code to force the date into UK order not USA order! 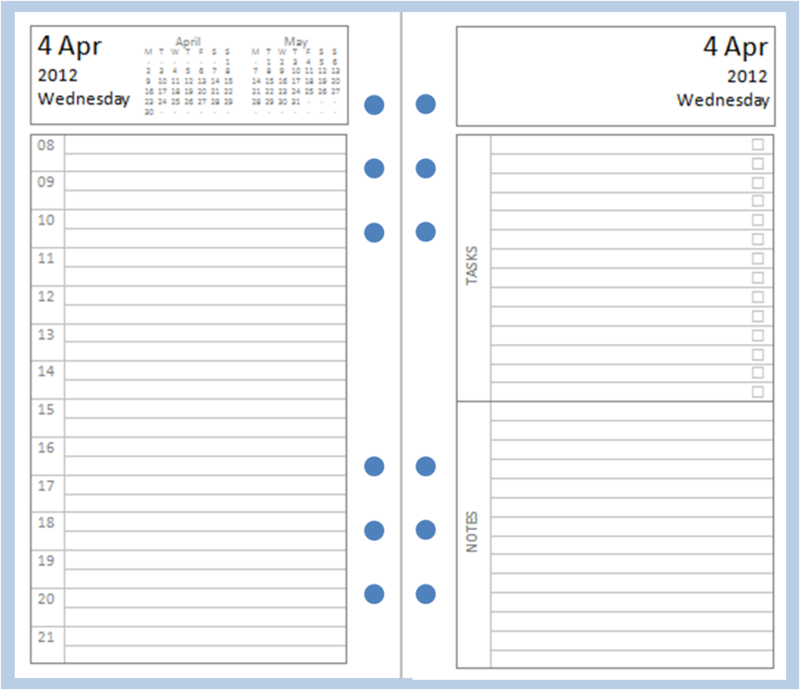 Think I need to get myself either a new blade for my trimmer or a better trimmer as its made the edges go funny but I at least now have some personalised, lined, week to view pages all nicely laid out and ready for use! Thanks for the source files that enabled me to do this! No problem. Fun, isn't it?